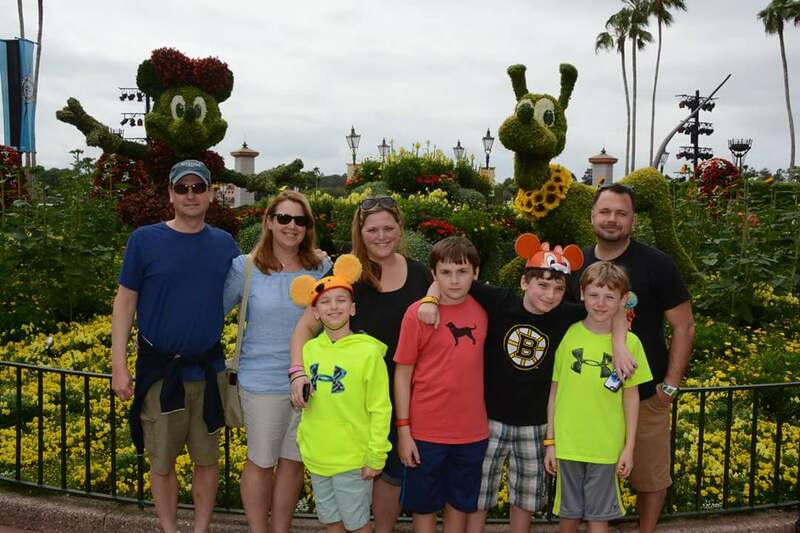 DISNEY 2016 – MAY THE 40TH BE WITH YOU – DAY 2!! Wow…today was a pretty frakkin awesome day. Got a great night’s sleep and woke up actually BEFORE the Pandora alarm clock (obvs set on the Disney channel) and Myles and I headed out early to get coffees and hot chocolates (and a Powerade for Owen). He led me on a pretty long way to get there, but it ended up being a pretty good route – took us by the bungalows, the beach and a couple views of the castle. I even Periscoped the journey (remember – follow us…I am waynegoody and Nickie is nickiegoody.) Was a rull nice start to the day. Then, after we all got ready we headed over with the Nerdlers to EPCOT. Yeah. First park day. Oh. Mornin Experimental Prototype City of Tomorrow. Yeah they brought over all the characters to our table and let us all take pic with them together. Which was purty cool. And then pretty much they all came over one by one after that so we essentially got all the characters over by the time our food came. That was very efficient. So. Speaking of food. Food was great. I think. I could taste things here and there. Very muted stuff. But I am confident I tasted a waffle there somewhere. We had this cray cray cinnamon bun thing. Which was all kinds of whoa and I can’t seem to find a pic at the moment but the cinnamon bake thing? It was cooltown. And they also brought over family style – eggs, bacon, ham, Mickey waffles and tater tots. They call them potato barrels there. But literally no one in any place ever calls them that. So. Tater tots. And they brought over a good amount of sauces as well as like real maple syrup. Which is sweet town. We really loved the breakfast. Seriously. We have eaten here for dinner before…but breakfast is def worth it. Worth. It. After breakfast, we did all sorts of attractions. We also ended up being first on Living With the Land. We are firstin all over this joint. Then we rode Test Track, Misson Space, Nemo and Spaceship Earth. , And…..we got to see the O-Learys after Spaceship Earth – Robyn, Terry, Jimmy, Maryanne AND my Aunt Dotty and Terry’s mom, Susan. After that, we headed over to the World Showcase. The boys started a Perry mission in Mexico and Matt and I had planned to start our own (tequila-based) mission but lines were kind of nuts. So like the boys did half a mission. And ours? Complete failure. So we walked through the countries. While I think we had a beer beforehand, we REALLY started things in China. With the Tipsy Ducks in Love. Coffee, chocolate, bourbon and well….whatever else is amazing. We also had some egg rolls there. And then we kept walking. In Germany, we got some beers and Matt decided I should have a Jager shot on account of berfdai. AND…and. We met up with Missy (awesome friend from high school) and her daughter Livi. Which was amazepantz, Always awesome to see them. They walked with us a little bit as we made our way around world showcase. We stopped in the Mistukoshi store in Japan to look around and then finally made our way over to France for our lunch at Les Chefs de France. Which is one of my favorites. We said goodbye to Missy as we watched her struggle with one of those Grand Marnier freeze pops and headed on in. And again. We ate ALL the food. We had escargot (two plates! ), cheese plates, charcuterie, lobster bisque…and that was just the appetizers. By the time our entrée came, we were like…oh right, we have more foods coming. Nickie and I both had the short ribs. Matt had the steak and Laura had the salad Nicoise . Short ribs. Please stop being so tastalicious. All. Like. Real. Good. I will say that the service here? Super slow.Again, we had A LOT of food. So somewhat understandable. But this was a 2 hour lunch. Thank God for wine. Also…c’est la mer. Right? I mean….the sea. After lunch, we went back to the room. Nickie and I took the boys down to the pools for some relaxing time. Started at the Oasis pool and then headed over to the main pool. Cuz waterslide. We then came back up, got ready and went back to EPCOT for dinner at Rose & Crown. And this is where things get awesome. So we wanted a table on the patio for the 9:00 fireworks. We told them before we left earlier in the day we were willing to wait. Whatever it takes. We wanted a table out there. We get there by dinner and Nickie walks up and asks. While she is there, Matt and I decide to grab drinks at the pub for the crew – two black and tans for us. Two white wines for the girls. And two Jameson shots for us. Only seems fair. We come out and they have a table for us. Not on the patio. What? I know. But we talk to them and say we are willing to split. Whatevz. You know? And they say well, we will see what we can do. They end up giving us two tables out right on the water. Literally center stage. At 8:00. Ah. May. Z’Town. We sit down…the four adults at one table and the four kids at the table right next to us. 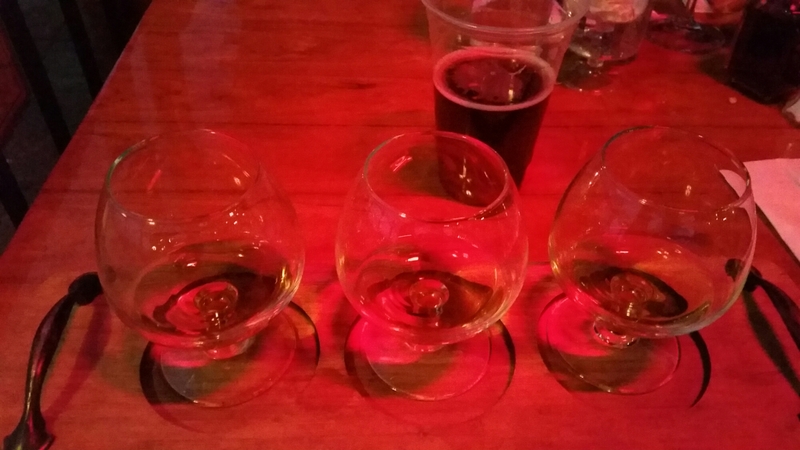 Nerdy and I order scotch flights. Because of course. And I had a picture of these. But now it is gone. Probably because of scotch. Edit. Here it is. And we got some scotch eggs, more cheese plates….But the amazing thing? Robyn, Terry, Jimmy and my Aunt Dotty ended up joining us. They let them just come in and have drinks at the table next to us. Aw man. I was sitting there and was like…yes, this is it. This is why I am here. Surrounded by so many people I love, eating great food, drinking scotch, watching my favorite Disney World fireworks. It doesn’t get better than that. Does it? And the restaurant was pretty great. Because we were celebrating my birthday, they gave me a crown, a signed menu and a super glittery cupcake. Yeah…Awesome. Seriously. Days don;t get much better than this one. I say that knowing I have a lot of great days ahead. Previous postDISNEY 2016 – MAY THE 40TH BE WITH YOU – DAY 1!! Next postDISNEY 2016 – MAY THE 40TH BE WITH YOU – DAY 3! !